The third congress ofthe European Association for Veterinary Pharmacology and Toxicol- ogy (EAVPT) was held in Ghent, Belgium, from 25 to 29 August 1985. Part I of the Proceedings of this congress contains the abstracts of all invited lectures, oral communi- cations and poster communications, presented at the congress. The invited lectures are now published (this volume) in extenso as Part II of the Proceedings. The editors wish to thank all invited speakers for their active contribution to the success of the third congress of EAVPT. They are very grateful to Dr. P. De Backer for compiling all manuscripts, Dr. P. Lees for scientific amendments, Miss B. Vermeesch and Dr. R. Lefebvre for preparing the camera ready copy and MTP Press for literary advice and publishing. A. S. J. P. A. M. van Miert M. G. Bogaert M. Debackere xi Contributors AMEND J.F. Department of Anatomy and Physiology, Atlantic Veterinary College. University of Prince Edward Island. Charlotte- town. P.E.I. CIA 4P3. Canada. ANIKA S.M. Department of Veterinary Physiology and Pharmacology. University of Nigeria, Nsukka. Nigeria. ARGENZIO R.A. Department of Anatomy, Physiological Sciences. and Radio- logy, School of Veterinary Medicine. North Carolina State University. Raleigh, NC 27606. USA. ARONSON A.L. Clinical Pharmacology Unit. School of Veterinary Medicine. North Carolina State University, Raleigh. North Carolina 27606. USA. AUCOIN D.P. The Animal Medical Center. 510 E 62nd Street. New York. New York 10021. USA. 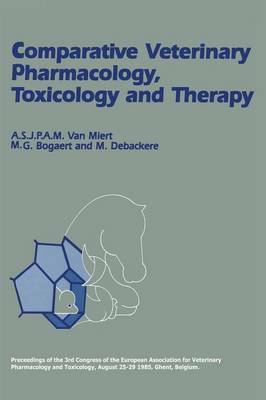 xiii xiv COMPARATIVE VETERINARY PHARMACOLOGY, TOXICOLOGY AND THERAPY BAARS A.J.